Clint is an imported 18.0+ hand KWPN and is very honest and brave. Despite his size he is in in your pocket oversized pony and has great stall and handling manners. He has impeccable breeding lines. He would be perfect for either the jumper or equitation ring for a very tall rider. He has the scope and heart to be a Grand Prix prospect. He would be perfect for an ammy or a professional on a budget wanting to start in the 1.10 m and move up. He actually sticks a bit over 18 hands. He is currently schooling at home in a professional riding program and is being sold as I am downsizing my business. We would accept a sale, lease or lease to purchase at this time. Price to increase with training. Please call Elizabeth 908.397.0977 for more details or for a full price listing. 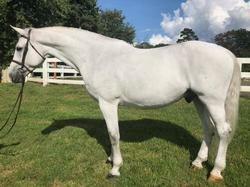 This is the second time Bigeq.com has helped me lease my horse. 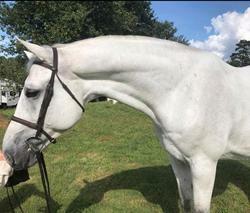 The site is just the best way to find the right person to fit your horse.